(By Osservatorio)Osama Bin Laden wrote a letter calling on the American people to help President Barack Obama fight “catastrophic” climate change and “save humanity”, in the latest evidence of his worries about environmental issues, newly released documents show. 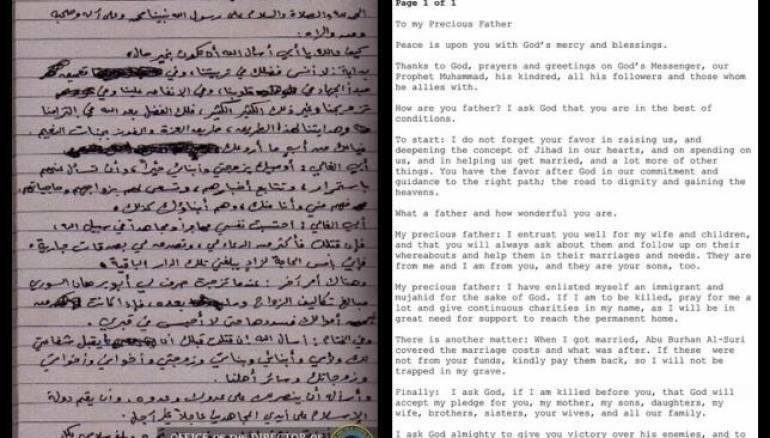 The letter was among materials that were seized in the May 2, 2011, U.S. raid on bin Laden’s hideout in Pakistan that killed the al Qaeda chief and which were released by the Obama administration. The undated, unsigned letter “to the American people,” which U.S. intelligence officials attributed to bin Laden, appeared to have been written shortly after Obama began his first term in 2009, based on the letter’s references to events. Bin Laden’s preoccupation with climate change also emerged as a theme in the first tranche of documents from the raid that was declassified in May 2015, as well as in an audio recording released via the al Jazeera network in January 2010. In the rambling letter Osama Bin Laden blamed the 2007-8 U.S. financial crisis on corporate control of capital and corporate lobbyists, and the U.S.-led wars in Iraq and Afghanistan. He called on Americans to launch “a great revolution for freedom” to liberate the U.S. president from those influences. That would enable Obama to make “a rational decision to save humanity from the harmful gases that threaten its destiny,” bin Laden continued. Bin Laden contended that the world would be better off fighting climate change than waging what he claimed was a war against Islam. “…the world should put its efforts into attempting to reduce the release of gases,” said the undated, unsigned letter to someone identified as Shaykh Mahmud that U.S. intelligence officials said they believed was written by bin Laden.